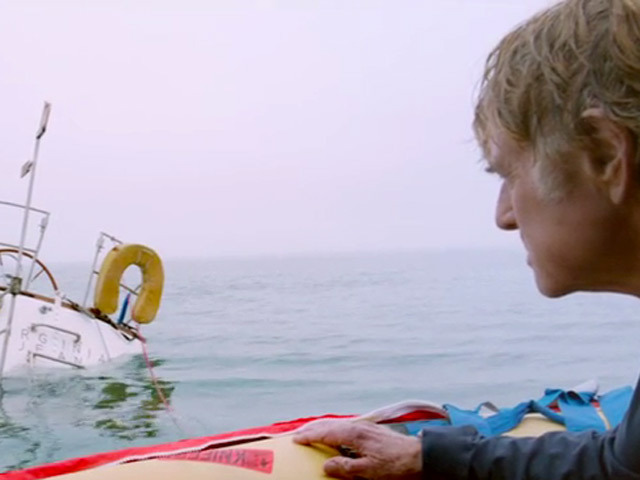 ALL IS LOST —–the gripping 2013 adventure was not Robert Redford’s final film role, but it admirably serves as a flourish capstone to his career, with the 77-year old star giving a remarkable physical performance, kind of bookending his turn in the classic Jeremiah Johnson, some forty-one years earlier (writing those last five words literally aged me). 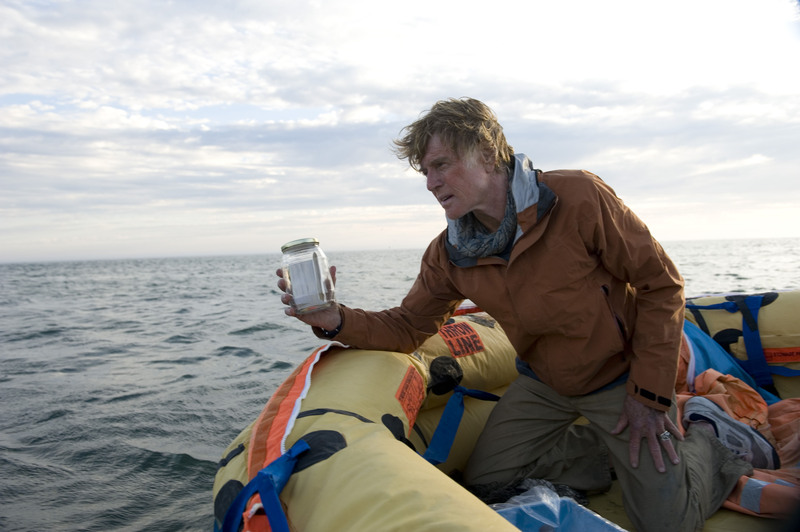 In this lean, stripped-down and gripping 105-minute saga, superbly directed by J.C. Chandor, Redford doesn’t contend with spooked grizzly bears, ravenous wolves or vengeful Crow warriors, but with a singular foe possessed of endless power, no second thoughts and and zero remorse—the Indian Ocean, when his sailboat is holed by a drifting shipping container. 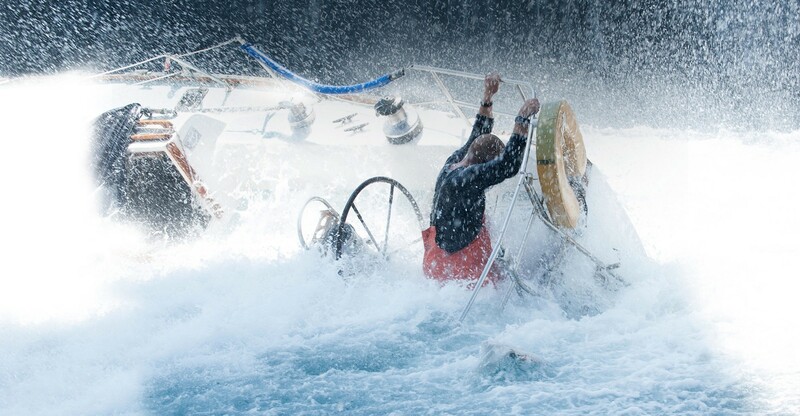 Alone (see:when brave becomes foolhardy) , the master of the yacht fully becomes the essential Captain of his life, as he fights to repair the craft, handle storms, attempt to make contact by the most limited of means, while juggling to contain his fears and keep his head as things turn decidedly for the worse. Without showboating (no pun meant), the weathered but still compellingly attractive and charismatic actor uses enough hands on, no-stuntman, exhausting-to-witness fitness to shame guys half his age, and does it all with a scant 31 lines of dialogue. Superior sound (Oscar nominated for Sound Editing), and unobtrusive scoring (Alex Ebert) complement the fine photography from Frank G. DeMarco, and the script wisely leaves its coda in the hands of the viewer, with some avenues opened for self-reflection on fate and impermanence. It was a cheat that Redford, never given enough credit over the years as a performer (the curse of those looks tripping up the pretend intellectuals in their own tired prejudices) was not allowed a place among the years Best Actor lineup. No statue from peers maybe (it did get strong reviews), but the movie is its own jury, and the verdict is just. Costing a fractional $8,500,000, it made a scant $14,000,000. Men who like Pit-Yourself flicks will salute this one.